Candlewicking is an old needlework craft that takes only a little ability and a few stitches to make something splendid. 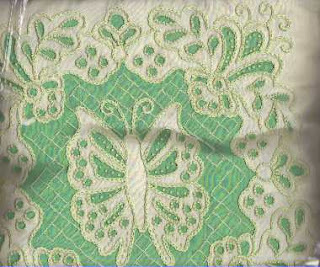 Candlewicking is returning to the needlework scene and is an embroidery you can use on many items. 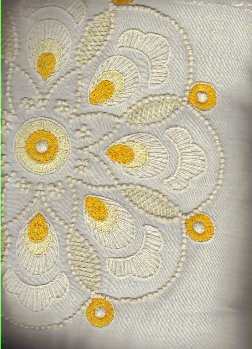 It is mostly French knots made with ecru cotton candlewicking thread. Satin stitch and chain stitches add texture and emphasis to candlewicking projects. Bring the threaded needle up through the fabric. Twist the thread around the needle three times and put the needle back down into the fabric close to where you brought it up, placing your thumb on the twisted thread as you pull the thread through to the back. Move to the next French knot and repeat the process. Satin stitch is a long stitch that fits the space you want to cover. This stitch works well for smooth leaves or specific shapes. Make the stitches close side by side. You can see some satin stitches in the gold pillow surface here. 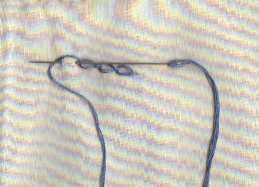 You can make a padded satin stitch by creating a row of long stitches going in the opposite direction before you start the top row of stitches. The chain stitch is ideal for outlining and is used for the green butterfly in the picture. Here's how to make the chain. Pull the thread through to the top and put the needle back down and up in a small stitch like a lazy daisy. Loop the thread around the needle, and pull the needle through the fabric. Move forward a few threads and place the needle into the fabric and bring it up about the same distance away as the first stitch. Don't pull the needle all the way through until you loop the thread around again. Needlework crafts are relaxing and beautiful. Enjoy candlewicking and embroidery crafts this summer while it is still too hot to work in heavier crafts like making afghans or quilts. Do you like frugal living? We have a new book entitled "Retirement Living Guide for Senior Citizens." If you are interested in frugal or green living and preparing for your retirement, you can read part of the book without an ereader at no cost.